This workhorse is the #1 recommendation of Cooks Illustrated's Test Kitchen. I use my food processor almost daily--don't know how I'd cook without it. 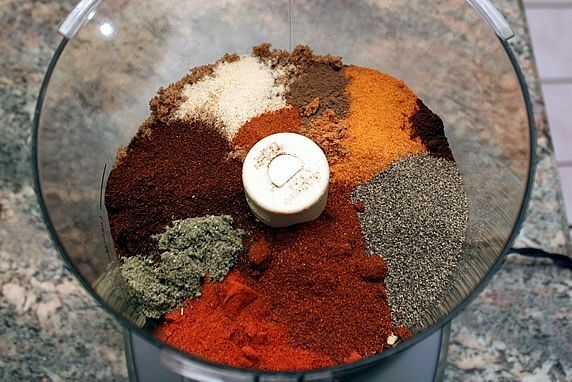 It takes seconds it evenly mixes the 14 spices for this dry rub. These full size sheets work with both laser and ink-jet printers. Print a sheet of labels, cut them apart, and adhere them to jars for a polished finishing touch. I have two sets of these versatile, durable pans; they get used frequently. I used the large one in this recipe. The lids are great for stacking and storing. These pre-cut sheets are so convenient! They fit perfectly inside the half sheet baking pans and prevent sticking. For seasoning chicken, pork, or beef, and great for gift giving. 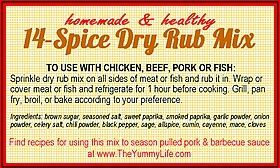 TO USE: Sprinkle dry rub mix on all sides of the meat (chicken, beef, or pork) and rub it in. If you have time, wrap or cover the meat and refrigerate it for 1 hour (or as long as 12 hours) before cooking. The fridge time will enhance the flavor, but it's also good if you cook the meat right away. Grill, pan fry, or bake the meat according to your preference. Also good for seasoning meat in slow cooker. --For a spicier blend, use hot chili powder (rather than mild) and more cayenne, cumin, black pepper. --For a sweeter blend, increase the allspice, cloves, mace, and brown sugar. --For a smokier blend, omit the sweet paprika and substitute all smoked paprika. Here is a recipe for a versatile, all-purpose dry rub that is delicious on chicken, pork or beef. It's the main seasoning in my Slow Cooker Pulled Pork. I also use it on ribs--either in the oven or on the grill. When you keep this spice mix on hand, it adds a complex combination of flavors to meats and sauces in a jiffy. It is all that's needed to season my homemade barbecue sauce. Learn how in my post 3 Barbecue Spice Recipes--Sweet & Tangy, Spicy, and Smoky. This dry rub mix makes a big enough batch that you can keep it on hand for jazzing up your meat at the last minute. 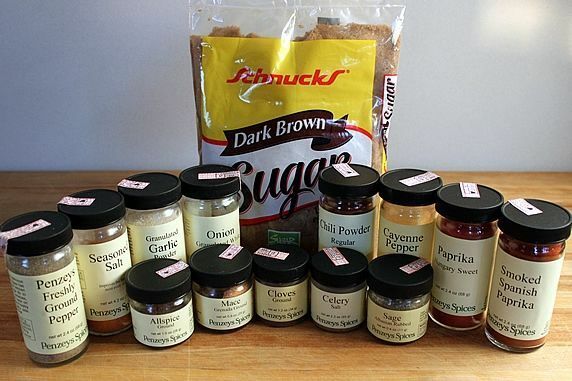 It is super easy--just mix a bunch of spices together, and you're done. This recipe combines spices with dark brown sugar. (The sugar adds flavor, and promotes browning.) It's sweet, savory, and spicy all in one blend. If you don't have all 14 of these spices, don't stress about it. An 11- or 12-spice blend will be good, too. Use the quantities of each ingredient as a guide to their importance in the mix. The seasoned salt and paprika are the largest quantities of any of the ingredients, so I don't recommending eliminating those. But the small amount of cloves and mace could be eliminated without significantly effecting the taste of the blend. What is MACE? This is not the same mace that is in an aerosol can and used to defend yourself against muggers. That kind of mace definitely has no place in a dry rub recipe! 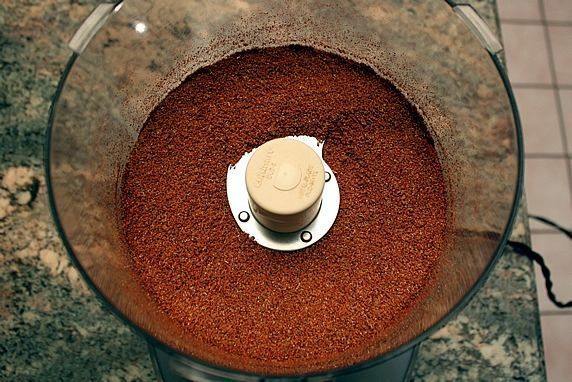 The spice form of mace is made from the dried fleshy covering of the nutmeg seed. It is a sweet spice that is compatible with spices like cinnamon, ginger, cloves, allspice, and nutmeg. You'll also find mace in my pumpkin pie spice mix recipe. It's easy to customize this mix to please your palate. 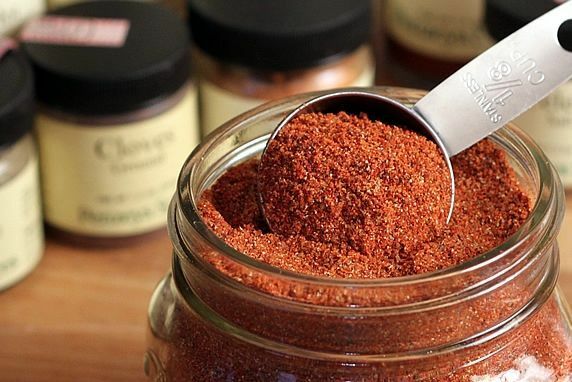 For a spicier blend, use hot chili powder (rather than mild) and more cayenne, cumin, or black pepper. For a sweeter blend, increase the allspice, cloves, mace, or brown sugar. For a smokier blend, omit the sweet paprika and substitute all smoked paprika. Makes a great gift! 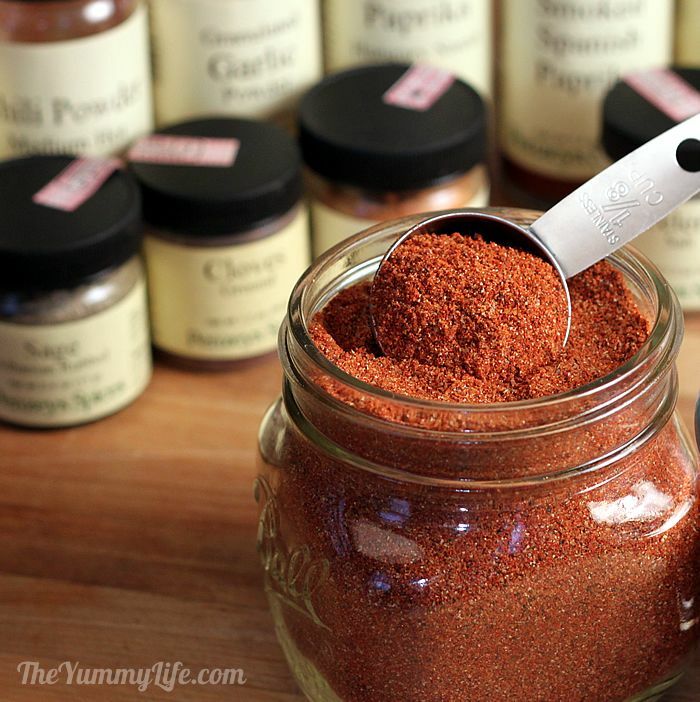 This spice mix is easy to make and have on hand for gift giving. It's long shelf life makes it particularly convenient. I've made labels you can attach to gift jars; you'll find them further down in this post. Step 1. Assemble the ingredients: See the spices listed above. Plus you need dark brown sugar. You can use light brown sugar, but the dark version has a richer flavor. Step 2. 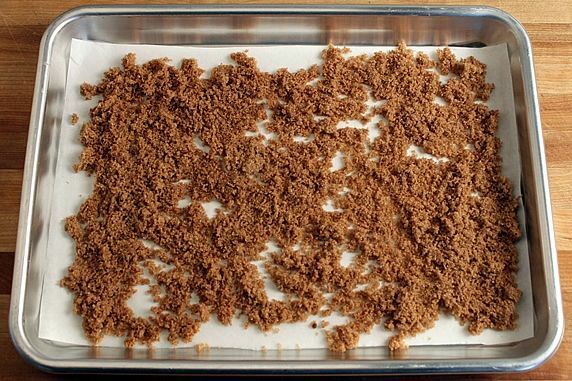 Spread out the brown sugar on a baking sheet and let it dry for 1-2 hours. This will prevent the mix from clumping. I line my pan with parchment paper to prevent sticking and make it easy to transfer the sugar to the mixing bowl. Or, you can use a silpat mat, if you have one. view on Amazon: 14-cup food processor --rated #1 by Cooks Illustrated Test Kitchen. Step 4. Pulse until well mixed. Step 5. Store in an airtight jar or container. 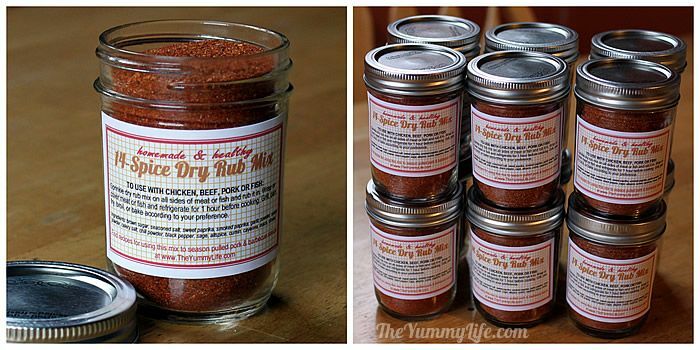 To use this dry rub mix, sprinkle it on all sides of the meat (chicken, beef, or pork). If you have time, wrap or cover the meat and refrigerate it for 1 hour (or as long as 12 hours) before cooking. The fridge time will enhance the flavor, but it's also good if you cook the meat right away. Cook the meat on the grill, in the oven or slow cooker, or fried in a pan, according to your preference. 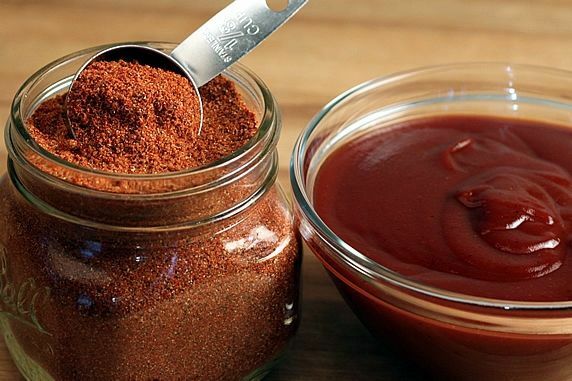 For a saucier coating on your meat, brush it with barbecue sauce during the last 5-10 minutes of cooking time. This mix makes a great gift! Print a sheet of these tags for adding the finishing touch to gift jars. It includes easy instructions for using this mix. I use mason jars for mine. To download and print a full sheet of tags, simply click on the image below.